Mr T.3 spent one evening while watching TV together making the lanterns. 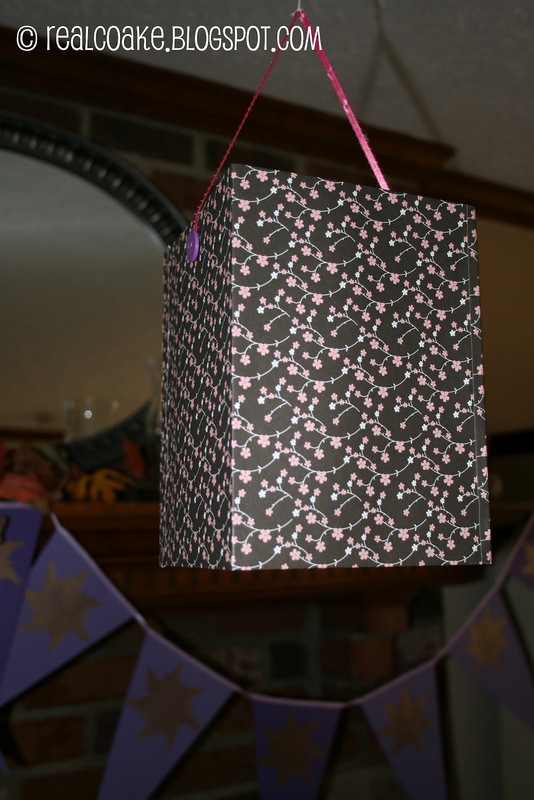 He simply followed the directions in the link to the sparkly paper lanterns above. Pumpkin and I had picked out the paper she wanted on a recent trip to Michael's for most of the supplies for her party. One mistake I made in the planning for this part of the decorations was in the number of sheets of paper to get. I was using 12×12 scrapbook paper. I, of course, didn't read the directions until Mr T.3 was about to start making the lanterns. It was then that I realized that I needed paper that was 24 inches wide. Of course 12×12 paper is only 12 inches wide. So, I ended up gluing 2 sheets together. 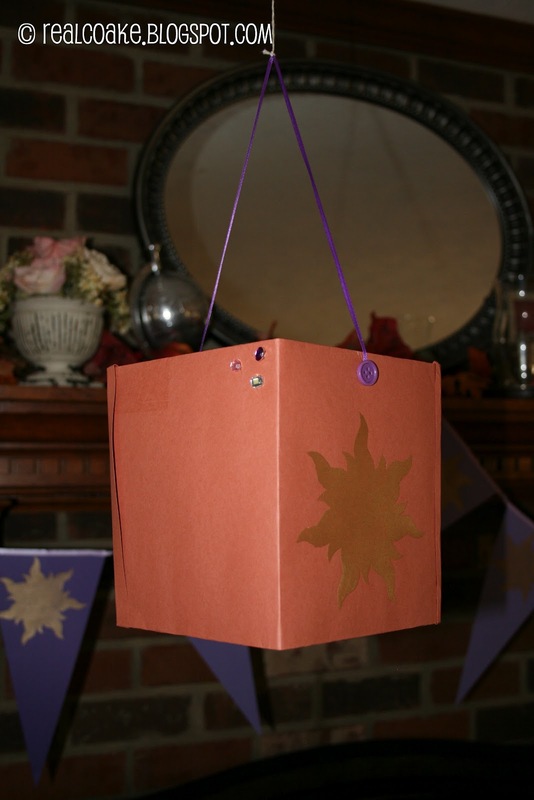 Therefore, I ended up with half the number of lanterns I had originally intended to have as decorations. 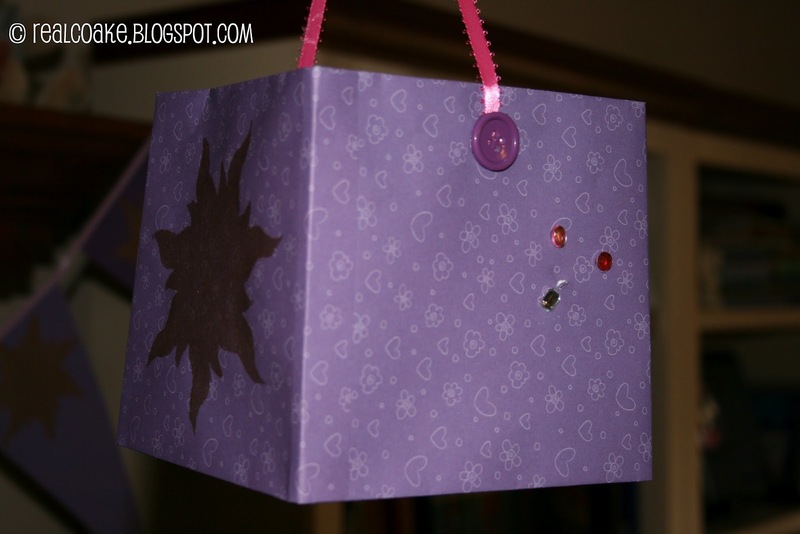 It worked out fine, but would have been really cute if I had more lanterns. If you plan to make these, just keep that in mind. Your paper needs to be 24 inches wide. Then you can cut that 24 inch wide paper into heights between 6.5 and 8.5 inches. After Mr T.3 put the lanterns together for me, it was time for me to stencil again. I used the same contact paper stencil and the same gold paint that I used for the favor bags and the banners/pendants. I choose not to stencil all of them, just for varieties sake. 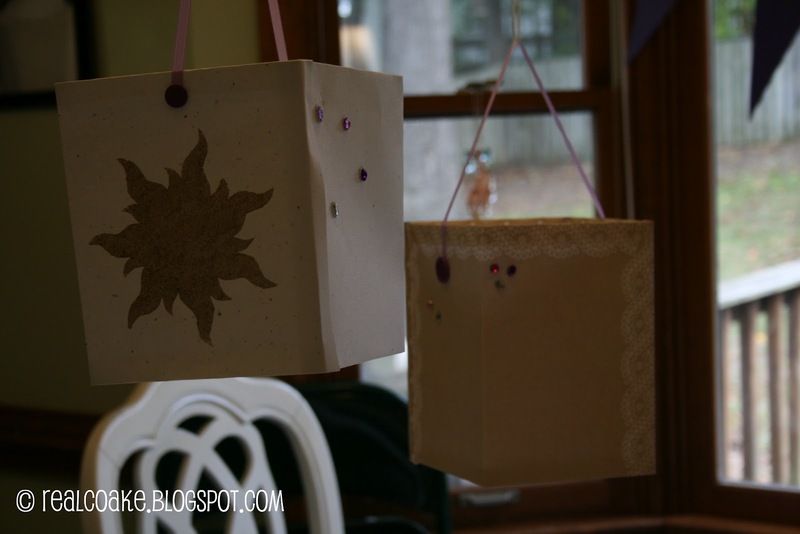 The lanterns that I did stencil, I only added the sun on two sides. 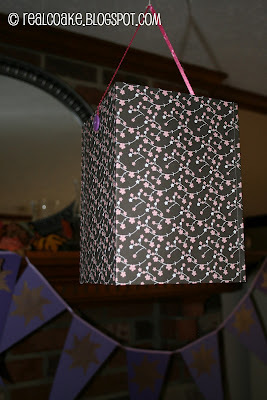 I made a total of 5 lanterns and had the sun stencil on 3 of them. I also added some small gems to some of the lanterns. The final touch was adding a purple button and varying colors of ribbon to the lanterns. 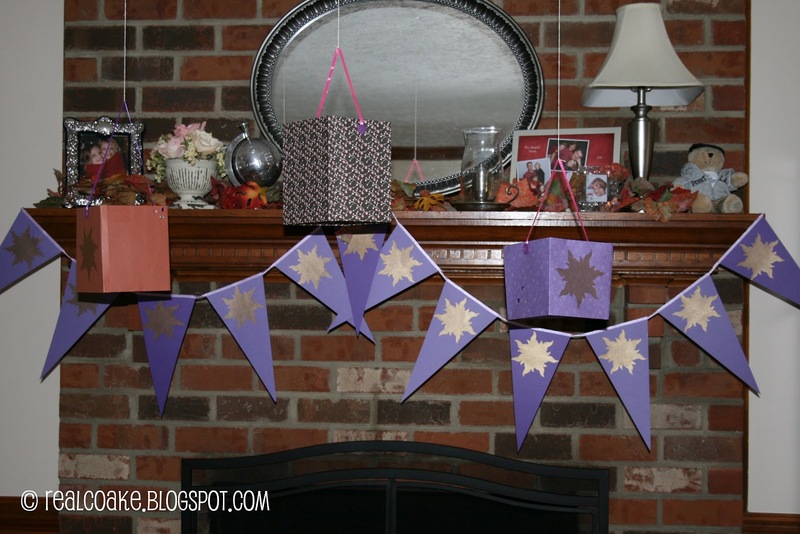 All in all, I thought these turned out really well and really added to our Tangled/Rapunzel theme. In fact they are still hanging in my living room and kitchen as I can't seem to get rid of them. Mr T.3 was just asking when we are taking them down, since the party was 3 weeks ago now. What to do, what to do….take them down and throw them away which seems wrong or take them down and sell them like Mr T.3 wants me to do….Neither seems right, so at the moment, indecision is keeping them up in my house! Well since Thanksgiving is coming soon and then I will be decorating for the holidays, I will have to decided soon!